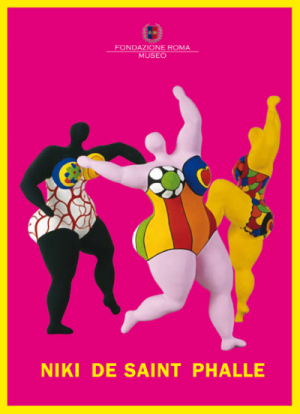 Italy’s first major retrospective exhibition dedicated to Niki de Saint Phalle will open on 4 November 2009 at the Museum of the Rome Foundation (formerly Museo del Corso). The exhibition will present more than 100 of Niki’s works, exploring what organizers call “an extraordinary artistic path that goes beyond classifications and fashions, mingled with a tumultuous and fascinating life.” The historic show will include many paintings from the 1950s and 1960s, as well as the famous polychrome Nanas for which Niki de Saint Phalle is famous throughout the world. The exhibition, curated by Stefano Cecchetto, is co-produced and organized by Arthemisia Group in collaboration with the Niki Charitable Art Foundation. The retrospective, which is sponsored by the Rome Foundation, will be on exhibit from 4 November 2009 through 17 January 2010.